The Corner House is more then traditional New England Cape. The spacious floor plan is truly functional for today's living. Three upstairs bedrooms, each with its own full bath, affords comfort and privacy. The fourth bath accommodates the den/bedroom option. 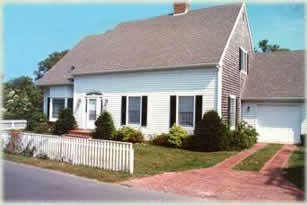 The white picket fence and the paved brick walk reflect the nostalgic charm and quaint Edgartown. The Corner House at 55 Cottage Street is adjacent to "The Captain's House" and right next door to "The Gables".